How do I go about preparing for a 100 miles I thought to myself? After running over 12 Ultra’s previously and never run all the way through the night there was a number of holes in my knowledge that needed plugging. I knew running a 100 was not all about time on your legs and I had to get mentally ready. It was time to book some training races in. Luckily Beyond Marathon the organisers behind Apocalypse 100 also ran a number of other events, so I signed in for Millennium Way (40 miles) and Wychavon Way (40 miles) as races that would enable me to push myself and to find out whether my fitness was going in the right direction. Both these events went well and I felt up for the challenge. Unfortunately, Neil has to duck out due to work commitments and a resultant lack of training ... so I was to be on my own ... eek! Four days leading up to the Apocalypse 100 event and disaster ... I fell victim to the dreaded office bug; it was touch and go whether my body would hold out and my lovely wife Amanda and my boss were both concerned that this challenge could set back a speedy recovery or worse. I made the decision before starting that at mile 40 if all lights were green I would push through and commit. My mind made up, I’d give it a go and with no pressure, just see how far I could get. I set about last minute preparations; no race would be complete if I did not have a shopping spree for some new bits of race kit, so 2 pairs of new Injinji socks, collapsible mug, body glide and waterproof holders for my maps. I was ready. I decided to delay setting out Friday night as I had originally planned to do and opt for an early morning start. This allowed me to get a good night’s sleep and to adjust some of my race kit; as it turned out this was thankfully a great decision. In the past, the night before a race would normally be restless, with little sleep and pre-race nerves kicking in. Considering I had an awful chesty cold I slept remarkable well with not a thought about the start. This would a good sign, my mind was in a good place and I felt stronger. On the morning of the race Amanda and I set of early in the motorhome at 5:15am (this was to be my Amanda’s and two dogs ‘accommodation’ for the weekend whilst I raced) and we made good time, arriving in Carding Mill Valley at 7:15am and with time for breakfast consisting of Porridge and my new found food ... Chia Seeds. Since reading the ‘Born to Run’ book these little seeds have become a new addition to my food intake. The race HQ is in the beautiful valley of Church Stretton; the weather for the weekend looked like excellent conditions. At 8:30am I headed out of the comfort of the motorhome and walked to race start with Amanda. Race briefing started at 8:45am and familiar faces started to appear bumping into Ian Hall who I had previously finished joint 10th with on the Wychavon Way (my local Ultra race). Previously I started races from the back of the field but with 100 miles ahead I just made the decision to run my own race and not get drawn into any other runner’s pace; finishing was the only thing on my mind my position and time was irrelevant. My mind was in a good place; I was here to test myself; the 10 second count down started and we were off; the race set of with Charlie Sharpe leading the field gliding up through the valley. At the time I thought Charlie was coming here to smash his course record as he was soon out of view. The first 50 mile was an unknown to me but I was not concerned, the route description was so good that the map just ended up being extra baggage for me. I was confident in the written description as 2 weeks previously I had headed to Church Stretton to perform a recce of that part of the course I would be running at night (which I calculated as mile 50 to 75). Weather was cool but comfortable at 9am and as the field headed out from Carding Mill Valley the field started to string out on the incline. It was time to keep a steady pace and make sure I kept fed and watered. After a few miles I started suffering from stomach cramps, I had not experienced this problem before in a race and I was unsure what was causing this. I decided that this was probably due to me drinking too much water in the early part of the race but it was bearable and was hoping it would ease. After a few miles we hit the first manned check point at Cefn Gunthly, which was the starting point for loop 1 of 4 code named: Conquest. I would return to the checkpoint 10 miles later via a few hills thrown in on the way. 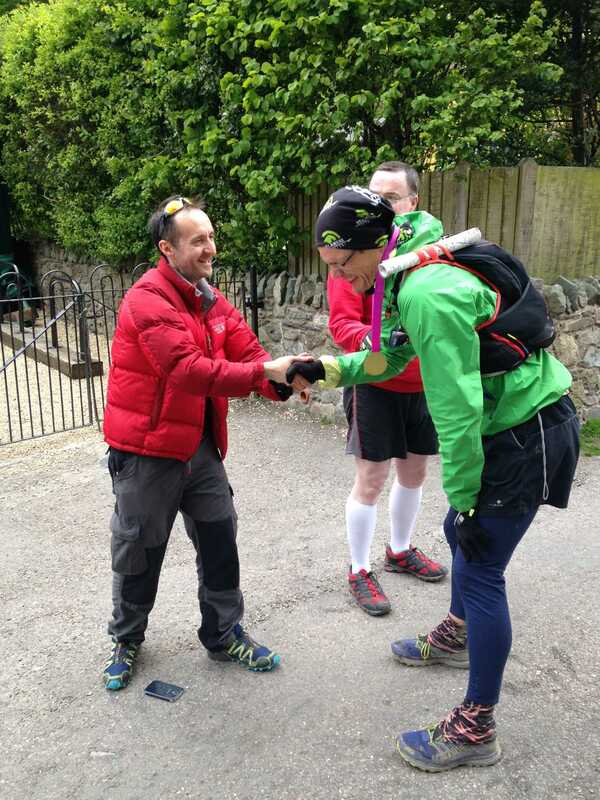 During this loop I bumped into Jacey, an American who found Ultra running bug whilst in the UK and had competed in every event that Beyond Marathon has put on and this was going to be his last before returning back to the USA. He was aiming for the 100 but his Achilles had flared up and a decision was to be made at mile 50 if to continue. We swapped tales as we passed each other numerous times during this section. My mind was still very focused on the 100 but I knew if my muscles were to start to feel lethargic I would have to make the decision to pull out. Luckily my body was ready for this and the cold I was suffering was just more a breathing inconvenience. The weather was holding out and was a pleasant running temperature, another great indicator. It was on the Shropshire Way shortly after a technical rocky section named the Stiperstones, a man named George came running buy. He looked strong and after sharing knowledge of books we had both read and this being George’s fifth 100 mile race it was good to be running with somebody who knew what it was liked to go beyond the magic 50. George was quietly spoken but clearly a determined individual. George told me about his day time job which sound fascinating but hard work as whilst I’m bashing away at a keyboard duing my 9 to 5 day he wwas taming horses in Ireland. From this point I thought I’m running with a Horse Whisperer; maybe that’s a good omen when I’m tackling the 4 horses of the Apocalypse! Time soon shot by and my stomach cramps were coming and going but I still did not have an answer to settle them down. I knew I had to keep fuelling myself even with stomach cramps as keeping the engine fed was important. Upon reaching the Red Lion at Longden for the first time, Phil, hooked into our running rhythm and we ran as group of three. Phil runs for charity and is known for running with strange household objects on his back, like tumble driers. From the Red Lion pub we were to head out to tackle the Famine Loop (a loop with a distinct lack of hills) but great scenery. It was time to fuel up, the checkpoint was an oasis of food from savouries to delightful cakes, nuts and sweets. But the first thing I had a craving for was a cup of Tea; the marshals were excellent and gladly filled our depleted water bottles and supplied me with a cup of T. At this point I decided to run out with only 2 full water bottles as this appeared to suffice previously. It was soon time to leave the comfort of the checkpoint and ‘Horse Whisperer George’ and ‘Phil Tumble Dryer marathon man’ and I headed out to tackle this loop. We were all in for the 100 mile race and Phil was glad to be running with runners who were committed to tackling the 100 mile race, as previously he was running with a couple of runners who were talking about bailing out at half way 50 mile point. On the return leg of the Famine Loop, back to Red Lion pub I was beginning to flag a little; I had a 4 miles left to cover on this loop and my personal water supplies had been fully diminished ... I was kicking myself as I had packed a spare water bottle but made the decision not to run with 3 bottles during the hottest point of the day. It was a case of digging in and getting back to the checkpoint to fill all 3 bottles and re-supply of food. I made the decision to have a Chicken soup at the checkpoint, which went down really well. My confidence was good and I was in a good place at mile 40. As we headed back to race HQ (the half way stage and the 50 mile race end) and were not far from Shooting Box car park, Phil turned around to me and said “that’s it; 50’s enough for me today”. I was surprised, but maybe the negative energy of the early runners had got to Phil. After returning to the race HQ at mile 50 it was a case of feeding myself and ready myself for the night leg. I had agreed with George that I would navigate with him through the night section as I was familiar with tracks from my having recced 22 mile of the route two weeks previously. Having this knowledge put me in a positive place as certainly there was opportunity to go the wrong way as the night closed in. Before I headed off for this leg it was time to hope into the motorhome for a complete kit change and to pull on my compression top and warm tight leggings, (thankfully a last minute kit change paid dividends). Heading out into the dark night with my fantastic Ayup head torch visibility was not a problem with two beams flooding the way ahead; it was like running in day light again. At first I felt I was going to overheat but as the night drew in the coldness started to kick in. It was about 5 miles in when my feet started to signal that something was wrong and I was running on a rather uncomfortable pocket of fluid on my left foot, just underneath the balls of my feet. This was not good, I signalled to George I would have to do some running repairs and stop to deal with the blisters the best I could. Not dealing with the problem could end my race. I told George that I would probably have to walk myself of the course but had concluded I had built up enough time to do this. George stuck by, but I was getting concerned that my slow progress would hinder him in keeping him warm. Unfortunately I had let old damaged skin heal over the balls on my feet and the blister was deep below; I prodded the area the best I could. I quickly dressed both feet to make them feel more comfortable, but walking was the only option. I aimed to get to the checkpoint at Easthopewood and survey the damage further. Luckily the blisters had not opened up and it was just a case of managing the pain; I had dealt with greater pain on the Lakeland 50 the year before, so it was ‘just’ a case of moving forward. Upon arriving at the checkpoint Wendy and Neil were making a fantastic effort in keeping morale going and supplying all the runners with food and hot drinks. It was time to inspect the feet. Focusing my efforts on the left foot it was difficult to locate the blister even treating my foot as a pin cushion made little difference. Neil kindly assisted and managed to release some fluid and Wendy stated she could get a medic over to the checkpoint; however, I said I would see how my feet held up over the ‘War Loop’. At this point George was cold, very cold, and Neil (the kind checkpoint marshal) lent George a very snug winter coat and a set of new dry socks. I was concerned that George should get moving to keep warm and that I had hindering his progress. We set off again. As a team we worked well, I had the benefit of navigation from my previous reccy and George his determination and experience of running through the night; we stuck it out together. Keeping a few paces ahead of me George waited at junctions that could cause a navigation error. We decided that if we could get back to the checkpoint it would not be long before dawn was due to break and the warmth of the sun would rejuvenate us both and so we kept moving forward at a slow and steady pace. Considering I had not run through the night before this was a new adventure to me and when listening to others I was expecting my body clock to switch over to sleep mode. This did not happen, the mind was focused or my head torch was so bright I thought I was still running in day light... who knows. We were still going and heading for Strefford Wood where the ‘Death Loop’ started. George and I had survived the darkness and dawn broke ... it was not long after that the light came up and my body decided that sleep was required. I knew things were not right when my straight line walking turned into what I could only describe was walking and swaying side to side almost if I had been on the pop the night before. I battled through only to be hit about an hour later by a second wave. George kindly offered me a small bottle of Coca-Cola which certainly appeared to awaken my senses. Coke very much seems to be the drink of choice when racing Ultra’s ... it sure beats any other sports drink. With my body wanting to sleep it was a case of willing my mind to get me to the next checkpoint for a quick sleep; this would be nearing the 76.5 mile point. By the time I arrived at the checkpoint I was keen to get a medic to look at my feet, stopping now would be soul (or should I say ‘sole’) destroying after battling through the night section. The Ultra Medix team assessed my feet and in summary said I could lance them but this could lead to wider problems but if I could put up with the pain I would be better just to keep going. The pain level had not changed, it was just damn uncomfortable and running was not an option; but if that was the only thing I needed to worry about it I was in a good place ... it was time to crack on and finish the final loop to the head home. George popped over and said that the medical team were pulling him out the race ... sadly the cold had clearly got to George. I was concerned that George had not eaten much and running 100 miles and keeping the body fuelled is an important part of the preparation; I was ready, fed and watered and very much focused at the task ahead. Leaving the comfort of the checkpoint, after 0.5 mile I realised George was no longer with me and I had left the checkpoint without wishing him fair well and safe trip back to Ireland (George, if you read this blog I regret not saying goodbye... I’m sure you will be back to tame the 4 riders of the Apocalypse). This final loop had a few surprises thrown in and certainly was not flat. Naming this the ‘Death Loop’ was a good way of summing up how I felt. At this point I had lost all sense of time. I had being going for 24hrs and had 20+ miles to cover. I felt quite emotional at mile 80ish although I was convinced I was going to complete the challenge. A quick emotional phone call to Amanda to tell her that I was OK and then off again. Another 8 miles I decided to call ‘Wallman’ (fellow ‘Spartan’ runner, Dave D); it was Dave who really got me hooked on Ultra running and little did I know when I started running with the Spartans, I would one day be taking on the epic of 100 miles. We had a quick chat and I took my first ever selfie, and then cracked on with the Death Loop. From this point I was pretty much on my own it was me and trail. I only wished I could be running and not hobbling on blistered feet. The day was warming up but my body had decided sleep was in order; I thought if I could make it back to the next checkpoint a quick power nap and I would be off. But this time it was different ... I needed sleep and now. Quickly I grabbed my iPhone, set up a 20 minute alarm and bedded down on the ground for a quick power nap. Before I knew it the 20 minutes was up; the 20 minute power nap had been enough. To think I was only about 1 mile from the checkpoint, but I felt I made the right decision. After a long leg back to the Strefford Wood checkpoint I replenished myself with a nice cup of mushroom soup and headed out to complete the final leg known as ‘Beyond Death’; just as if things could not get tougher at mile 90 there is a large hill climb to take me back on top of the Long Mynds. During this ascent I spoke to a few more of my Spartan friends to drive me along; thank you all for taking the time to take my call, your friendly words of encouragement pushed me on. I also called Amanda, who said she’d walk out to meet me for the last section. As it turned out, Amanda was concerned that when I asked I couldn’t remember whether or not I’d been through the woodland ... a big area with lots of trees ... and therefore managed to get a lift from Wendy (thank you so much Wendy) to the woods so she could catch me up (thankfully the tracking meant they knew roughly where I was, which was obviously more than I did). As I was hardly moving quickly Amanda caught me up at the Gliding Club at the top. It was clear that my progress was slow and I even made a navigation error a few 100 metres upon leaving the gliding club which she rightly questioned and had us back on track. Luckily all the difficult climbing had been done it was case of heading to Pole Bank, the final self clip checkpoint and then heading back to the finish. Amanda kept my spirits up for the last 5 miles and I even managed to speed up, running as we both dropped back into Carding Mill Valley to the realise a goal of mine, my first 100 miles had been completed. Finishing 37th from 58 starters I was emotional and ecstatic (from 58 starters, 39 finishers, 67% success rate); I had finished my first 100 mile event, the time was irrelevant but managing to come in under the 33 hours cut off, at 32hrs and 53mins felt great. I know I will be back on this course to give this race justice and hopefully with my lungs working at optimum performance and with softer feet. PS. Felt rotten in the night (sore chest and painful feet and muscles), woke up ... fell over ... had to be picked up and ushered back to bed, and then watched over in case I fell unconscious ... what we put our partners through!